…Imagined you are looking down from above at your bike as it moves down the highway, giving you a sense of how small you really are in the world? …Imagined a particular soundtrack playing along with the above “movie scene”? …Happily recalled days on the bike that were terrifying at the time, but appreciate them now because they make such good stories? …Noticed that when you ride or drive on a brand new street in your hometown that it just feels really weird, like you aren’t even in the same city? …Suddenly had to make an emergency head call the moment you got the last of your gear snapped or zipped? …REALLY wished you would’ve remembered to put the kickstand down? Okay, your turn! Just for fun, start with “Have You Ever…” and add your best bike-related question in the comments! 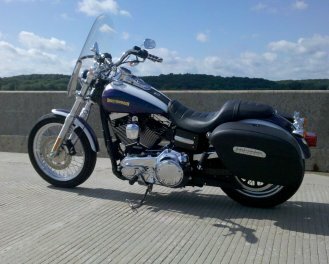 Have you ever wished you had secured your helmet on as it went rolling down the highway? Have you ever headed out for a ride only to realize 2 blocks from home that it’s a little cooler than you thought and had to turn around and go put more clothes on?? Have you ever been riding down the street feeling really free and easy when you realize that your helmet is still hanging on your sissy bar? Ever stop to fill your near empty gas tank an hour away from home, and suddenly remember you left your billfold in your other pants? Have you ever stopped at the entrance to a gated community, realized that you don’t have your remote to open the gate, think I’ll just lean over and punch my code in on the keypad, only to realize that you didn’t pull-in anywhere near close enough to that keypad when you and your bike both start to topple over. All good ones, thanks for sharing them!